Mostess is a subscription box for people who love to entertain! It’s a seasonal package filled with curated party items, recipes, and other ideas to help you host beautiful gatherings. Coupon: Get free shipping on your first box! No coupon needed, just link here. The theme for the Winter box is “Cheers”! After introducing you to all of the items in the box, you’ll get into the decor & hosting tips section. I love this tip about re-using your Christmas decor for New Year’s Eve with just a few small changes! These images also feature items from past boxes to help subscribers think of ways to re-use items they may already have at home for their gatherings this season. There are a few small recipes for Rosemary Pecans (yum!) and Tableside Whipped Cream (featuring one of the items in this month’s box). And a few cocktail recipes as well. Irish Coffee is very popular in our family on Christmas Eve, so I’m looking forward to the addition of some frothed milk this year! The rest of the items in the box are packed under the initial tissue and info booklet, adding to that highly giftable and fun-to-unwrap experience. All of the items are typically packaged in their retail packaging, too, making them easy to break apart into smaller gifts if you like. I am an absolute hot chocolate fiend in the winter time, and this blend does not disappoint. I’m used to cocoa with a 2 or 3 Tablespoon serving size with 6 oz of milk, but this brand recommends 4 with 8 oz of whole milk, so it’s a bit richer. I love this style of tin for the packaging. It’s easy to scoop and has such a great holiday pattern. I’ve actually been considering buying a small disco ball lately just for fun. These drink stirrers are so cute and festive! These swizzle sticks are about 5.5″ long and have a nice weight to them. I couldn’t find detailed product info, but I believe the actual part that goes into your drink is stainless steel, and the disco ball toppers are plastic. My little sister happens to have a December 31st birthday– so I’m thinking of adding a few to the bow on her birthday present. There are lots of fun ways to use these even if you’re not a big cocktail or mocktail drinker! Of course, if you are making cocktails, Mostess has also included these unique vermouth brined olives in your box this month! Mostess suggests using these in a martini bar, but they’d be just at home on a charcuterie and cheese platter. They definitely have a strong and unique flavor thanks to the vermouth and are sure to have guests talking no matter how you use them! I already had a frother like this at home (from IKEA), but this one is quite a bit nicer and is a really great idea for giving an extra oomph to your warm holiday beverages. This frother takes two AA batteries, which are not included. The Fomini is comfortable and easy to hold, and I love that it comes with a stand– that makes it easier to quickly wash and leave to dry after using, plus it’ll be ready for the next person who wanders over to refill their coffee cup. I only wish I’d added a tiny bit of the hot cocoa mix on top of that foam! This piece is made in America and definitely has a retro feel to it. It made me recall a similar candy dish that my great-grandmother always had filled with licorice and caramel candies. The bowl features an elegant floral cut glass design. I am loving the festive bright red; it catches the light beautifully in person. It’s a smaller size, so perfect for after dinner mints and candies, just like my great-grandmother would have used it. Finally, we have this set of 4 dessert plates from 8 Oak Lane. These have a black and white plaid print with a delicate golden rim, and come neatly packed with bow and tag. I love this pattern! It goes perfectly for fall and winter holidays, but I could see myself using these year round. They are hand wash only and cannot be microwaved, which is typical of other metallic rimmed ceramics I’ve owned. They’re the perfect size for a slice of cake, or as a mug saucer with a few cookies or macarons on the side. Verdict: Mostess always seems to have great curation and packaging, and my first time reviewing this box did not disappoint. The items all felt unique and of high quality (like the amazing hot cocoa mix and really unusual olives), and everything will definitely add some much-needed flair to my holiday entertaining this year. The retail value for the items in the box works out to about $150, which is the range we’ve come to expect for this $125 subscription box (and above the price tag even at the $135 one-time purchase price). Together with the whole presentation and the booklet of inspiration and ideas, Mostess is a really fun quarterly package, whether you host get-togethers yourself or are looking for a thoughtful housewarming gift. 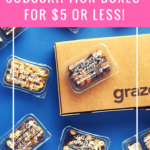 Coupon – Get free shipping on your first box! No coupon needed, just link here. What do you think of the Winter Mostess Box? Check out all of our Mostess reviews and the Women’s Subscription Box Directory! How do subscribers rate Mostess Box? Do you subscribe to Mostess Box? Add your rating now! This is usually such a cool sub but, I’m not too impressed with the winter box. I’ve always thought it was overpriced & this month the value isn’t there for me at all. While it is all lovely there is nothing I couldn’t pick up for much much cheaper. Great review and beautiful photography! Great review! Did you mean to type that there are 4 plates? You listed 8 but showed four. I love all your pretty photos! Yep, I totally typed 8 because the brand name is 8 Oak Lane. Thank you for catching that! Will fix it now!